Typical borehole geophysical logs include gamma, temperature, resistivity, conductivity, caliper, and magnetic susceptibility. There are many variations and configurations possible for these methods. For example, the gamma logs can be for total count, uranium, thorium, and so forth. Resistivity logs can be for various pole-dipole configurations, with a transmitter electrode located on ground surface. The conductivity log can be acquired with one inductive coil or a Tx/Rx coil-pair for deeper penetrations. IP/Resistivity borehole surveys consist of detection and cross-hole logs. 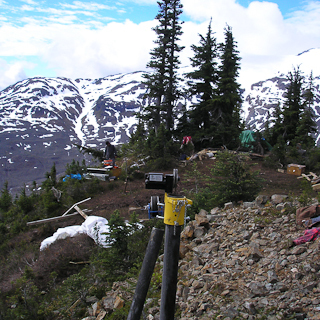 Detection logs are collected to correlate geophysical responses directly with encountered mineralization. Cross-hole logs are collected between borehole pairs with various transmitter and receiver configurations. Surface data are also collected, typically in dipole-dipole mode, to complete the data coverage. All three data sources (detection, cross-hole, surface) are georeferenced in 3D and formatted for input to UBC inversion software DCIP3D. Final results from the inversion software are presented in Geosoft Voxel along with geologic assays, structure, % sulphides and other information of interest. The 3D presentation can be rotated, zoomed, sliced and diced to assist with the Geophysical Interpretation. TDEM borehole surveys consist of a dummy probe test followed by a 3D probe receiver log. The transmitter consists of loops of heavy gauge wire located on surface. The loops are moved to various positions depending upon the target EM coupling being sought. Survey planning and interpretation are aided with the use of industry standard modeling sofware. As with IP/Resistivity data, the TDEM results are processed and presented in georeferenced 3D.